We investigate the propagation of probabilistic uncertainty through the action potential mechanism in nerve cells. Using the Hodgkin-Huxley (H-H) model and Stochastic Collocation on Sparse Grids, we obtain an accurate probabilistic interpretation of the deterministic dynamics of the transmembrane potential and gating variables. Using Sobol indices, out of the eleven uncertain parameters in the H-H model, we unravel two main uncertainty sources, which account for more than 90\% of the fluctuations in neuronal responses, and have a direct biophysical interpretation. 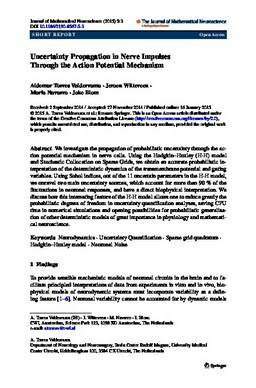 We discuss how this interesting feature of the H-H model allows one to reduce greatly the probabilistic degrees of freedom in uncertainty quantification analyses, saving CPU time in numerical simulations, and opening possibilities for probabilistic generalisation of other deterministic models of great importance in physiology and mathematical neuroscience.